Only 61% of refugee children attend primary school, making them five times less likely to attend school than children in their host communities. Only 22% are receiving a secondary level education. Reading facts like this, it can feel like we’re a long way from real progress on meeting the New York Declaration’s commitment to get every refugee child into school ‘within a few months of arrival’. However a new report from Save the Children has set out a global plan of action to achieve just that. Time to act draws out a series of policy recommendations and practical changes that are needed to ensure these children not only get into school, but are learning from a quality education as well. We’re pleased to highlight that case studies from the Promising Practices in Refugee Education initiative have been used in the report, including WUSC, Relief International, Windle Trust Kenya, and the Vodafone Foundation. Inclusion: support for including refugees in national education systems. Improvement: increasing efforts to ensure children are learning. Investment: mobilising the funding necessary to scale up access to quality learning opportunities for refugees. It also sets out suggestions for an accountability framework to monitor progress and ensure collaboration in the delivery of the plan. 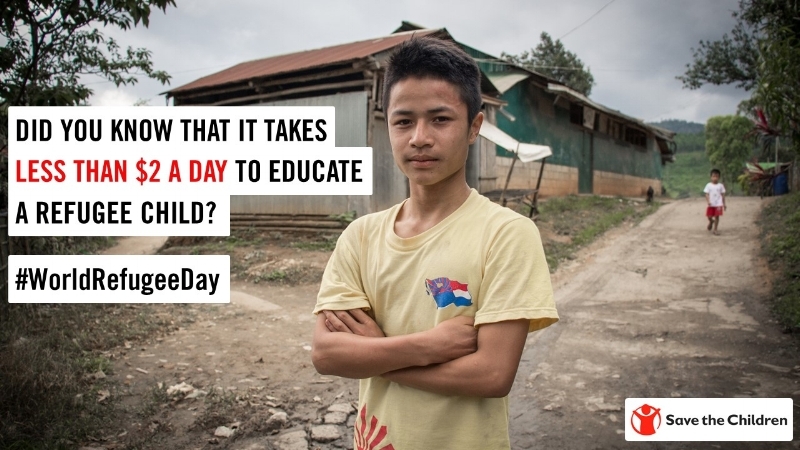 ‘Time to act’ shows that we could deliver quality universal pre-primary, primary and secondary education to the world’s 7.5 million school-age refugees for $21.5 billion over five years – that’s the equivalent of just $575 per child per year. It recognises that countries hosting refugees perform a global public good for the international community as a whole, and should be supported in doing so. However, not all countries require the same level of support, so the proposed costings reflect different levels of support for refugee education in line with national capacity. With this in mind $11.9 billion would be needed in international assistance to cover the five years. To put this into perspective this year’s World Cup has cost $11 billion to stage, so although the figures look large they represent a relatively modest investment which could reap massive benefits. There is a wave of momentum in the global refugee education discussion at the moment. If we look back at 2016 there are a few highlights where we start to see it move up the international agenda, such as the establishment of Education Cannot Wait, the commitment to responsibility sharing at the Leaders’ Summit for Refugees, and the New York Declaration. In 2017 there were further developments , including the launch of the Promising Practices initiative, and the Djibouti Declaration on Refugee Education which includes a commitment for all refugees in IGAD countries to be included in national education sector plans by 2020. And in 2018 there’s been a focus on girls’ education that has provided a platform to push forwards the agenda on education in emergencies, including a record financial pledge at the G7. And now the establishment of the Global Compact on Refugees and its associated Programme of Action, which will be adopted by UN Member States this year. The Programme of Action has a specific section for considering the distinctive needs of refugee education, and even includes text that follows Recommendation 1 from the Promising Practices Synthesis Report: strengthen national systems to include refugee children. With all of this in mind, there is no better time to put forward such a plan, and no better time for leaders to make new commitments. The futures of 7.5 million refugee children – their happiness, health, safety and livelihoods – depend on our getting it right. The time for action is now.